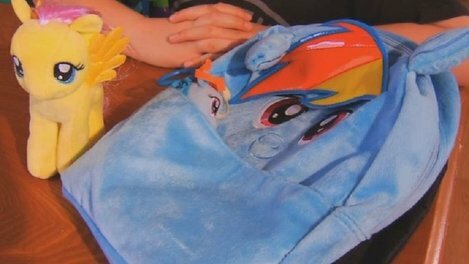 If you have been on Facebook lately, you’ve probably seen one of the many posts about 9-year-old Grayson Bruce who was told by his school not to continue carrying his beloved “My Little Pony” backpack. While this isn’t an issue of discrimination or bullying towards a transgender child, the seemingly growing divide between what is accepted as “ok” or “normal” for each gender certainly is a problem that can and will affect the transgender community. In Grayson’s case, rather than deal with the bullies (at of the time of this post, the school still hasn’t done anything to reprimand them), the school counselor told Grayson that the backpack is a “trigger for bullying” and should be left at home to prevent more problems. Grayson’s mom wisely pointed out that blaming the backpack is akin to saying a woman’s short skirt was to blame for her being raped. Blaming the victim never makes sense. Grayson has received an overwhelming amount of support and even has a Facebook page dedicated to him. Supporters are calling on the school to allow Grayson to carry his backpack and to address the bullying more directly. Just in case you don’t think a little bullying of a “Brony” is a big deal, it also led to an 11-year-old boy’s attempted suicide earlier this year. Michael Morones tried to hang himself from his bunk bed railing after being teased relentlessly at school for liking a show that promotes friendship. As a society, it’s time to put aside the idea that pink, ballet, and ponies are only acceptable for girls, or that blue, football, and lions are only for boys. We are causing serious damage to our children — all of our children — by promoting such strict gender stereotypes. This entry was posted in Activism, Education, Youth on March 18, 2014 by .